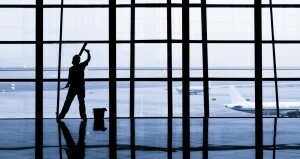 Window Cleaners take into consideration a host of factors for any given project. Apart from the size and height of windows, they also take into consideration the type of glass before choosing the tools and equipment that will complement the task appropriately. This is a type of clear window glass named after the process used to produce it. It is made by floating molten glass on metals like tin at extremely high temperatures. The molten glass and tin is mixed but as the glass is still viscous, they do not mix but stay afloat. Cleaning of float glass is straight forward for professional window cleaners. Even if the glass needs tape or paint removal it can generally be addressed without any complications by using a professional grade scraper along with the correct technique. Tempered glass is a kind of safety glass commonly used in places where standard glass could pose a potential danger. It is many times stronger than standard glass and does not splinter when it breaks. Washing tempered glass requires the use of specialized tools. The most clear and present danger are scratches. Tempered glass must be handled with care and any stain, tape, or paint removal must be handled only by the most experienced window cleaner. This is a specially laminated glass that has a wire between the sheets of glass. It is used mainly for security and it is generally part of a circuit that can be connected to an alarm that is set off when the glass is damaged. It is best suited for securing commercial or industrial premises. Professionals are needed to clean and maintain alarm glass to avoid damage the wiring and to achieve a quality crystal clear finish. This is a fairly clear and transparent glass that’s created using a procedure in which it is coated with layers of metal oxide. The glass reflects a low percentage of light. It is used in places where there is need to have a clear view. For anti-reflective glass it is preferable to employ the services of a professional cleaning company to achieve a completely clear and smudge free view. Electro-chromatic glass is designed to reduce the use of curtains or blinds. This glass can change with the amount of light passing through according to the intensity of the sun’s rays. The cleaning of electro-chromatic glass is best handled by experts only. Fire resistant glass is a wired glass that’s reinforced and hence offers a certain amount of protection against fires. It does not prevent heat from being transferred to the other side of the glass, in others words it would still be hot to touch. Washing and maintenance requires the professional touch and the correct tools. This is another type of security glass that does not easily break because of a sandwich effect as there is a resin that holds the glass layers together. This coating over the glass ensures that even when the glass does crack, the pieces are held together thus preventing splinters from flying all over the place. It is recommended that you employ the services of a professional to deal with the cleaning of laminated glass.